With 450 years of history under its belt, St. Augustine has dozens of boutique and interactive museums. Don’t miss these hidden-gem art, history and cultural museums on your next visit to Florida’s Historic Coast. Ever wondered how America’s wealthiest families vacationed in the late 1800s? 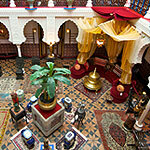 Many original snowbirds flocked to the opulent Alcazar Hotel in St. Augustine. Today, The Lightner Museum showcases authentic Tiffany glass and collections of 19th century antiques that reflect the elegance and beauty of that bygone era. 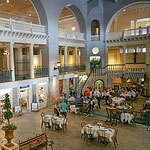 Visitor’s Tip: Stop for lunch in the museum’s Café Alcazar, located at the bottom of the former hotel’s indoor pool. 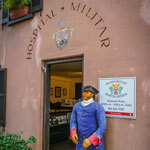 Get a dose of history as you experience what it might have been like to be a hospital patient in Spanish colonial times. Herbal medicines and cringe-worthy surgeries of the time are demonstrated in these tours of the historic Spanish Medical Hospital. So take a look around, the doctor is always in. Visitor’s Tip: Explore the herb garden and potentially leave with your own medicinal recipe! Louisa Fatio was an unmarried woman determined to make her way in the world in the 1800s as an innkeeper – and doing so helped open doors to new industries that would become crucial to Florida – hospitality and tourism. Hear the stories of the guests who stayed at the Ximenez-Fatio House, a boarding house that was operated completely by women. The Villa Zorayda was first built in 1883 as a winter home, and constructed using poured concrete and crushed local coquina shells. Not surprisingly, this castle, modeled after a section of the Alhambra Palace in Granada, Spain, was a film location for the 1912 movie, “The Arab’s Bride.” Visitors can also view a wide array of Egyptian artifacts and antique items on display in this beautifully preserved villa. Visitor’s Tip: During the winter holidays, the museum offers exclusive candlelight evening tours. Climb 219 steps of history that include storms, fires, and whale watching to discover a timeless, awe-inspiring view. It is famous as the oldest working light tower to guide ships to the shores of North America, but that’s just the beginning. The Lighthouse and museum offer a wealth of programs and activities. Visitor’s Tip: There’s more to do than just climb the steps – take a behind-the-scenes tour or see a boatbuilding demonstration. A splash of modern in the Ancient City, the Crisp-Ellert Art Museum features contemporary artwork of regional, national and international artists. 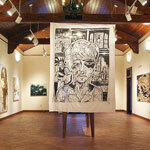 This diverse collection is located on the campus of Flagler College, known for its strong design program. Be sure to check the museum’s schedule for the always-changing lineup of exhibits. 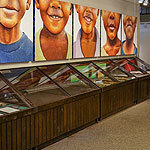 Located in a former segregated school, the Lincolnville Museum & Cultural Center stands today as a historic and educational center of African-American heritage. The center chronicles more than 450 years of African-American history in North Florida, and includes unique artifacts, such as restraints from when Rev. Martin Luther King Jr. was jailed in St. Augustine. 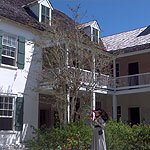 Discover unique heritage through storytelling at the Lincolnville Museum. Visitor’s Tip: Engage with the staff and guides. They are happy to tell stories and provide personal tours. Step back in time to a melting pot of history, culture, and architecture in the nation’s oldest city. Interactive tours and hands-on activities walk you through three centuries of British and Spanish colonial rule. A 2-acre area rooted in the past, the Colonial Quarter is a unique way to see what it was like to walk in a colonist’s shoes. Visitor’s Tip: In the evenings, stay for a free concert at the Colonial Oak Music Park. 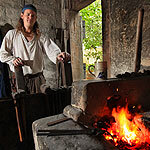 A history full of bandits and treasure, pirates are a significant part of the old city’s past. Located next to the Matanzas River, St. Augustine was an unfortunate target for frequent visits from pirates. 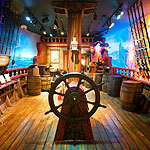 The Pirate and Treasure museum not only offers an interactive look at the pirate history of St. Augustine, but also the treasure and stories of famous pirate captains from all over the world. A hidden gem along St. George Street, the St. Photios Shrine tells the story of Greek immigrants who came to the shores of St. Augustine in 1768. 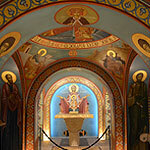 A short movie and display of artifacts lead you to a magnificent Greek chapel, filled with exquisite Byzantine and gold-leaf frescoes depicting saints of the Christian Church. The oldest Catholic Church in the nation’s oldest city. The cathedral’s architecture is inspired by St. Augustine’s Spanish heritage. 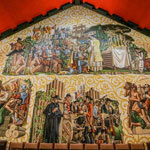 Stained glass and exquisite murals depict scenes of St. Augustine of Hippo, the city’s namesake. Guided tours are offered throughout the day. 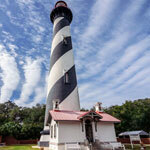 For more tips to plan your St. Augustine visit, click here to our travel itineraries.